Every now and then I do make a pumpkin dish that is not a dessert. 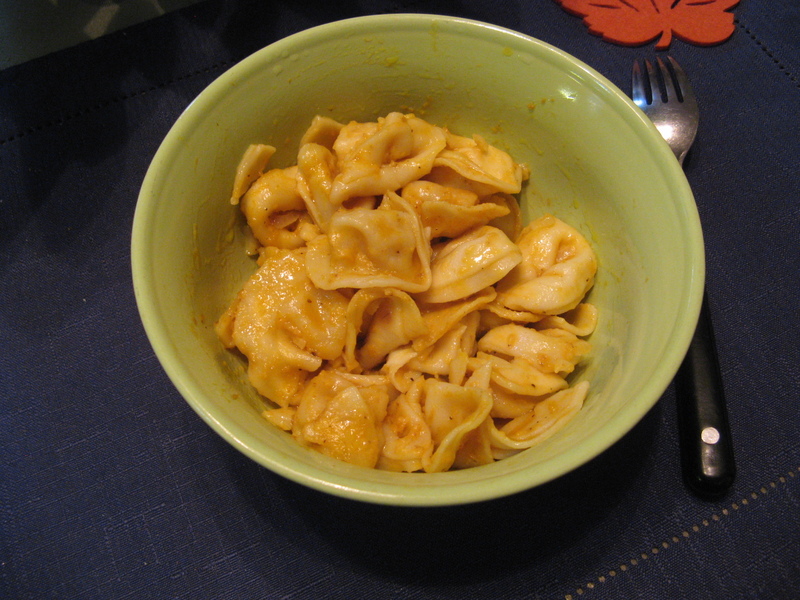 I’ve actually made this dish quite a few times (I mentioned it in a post way back in 2013, but, never actually blogged about it) but, this was the first time I followed the recipe and used tortellini as opposed to another type of pasta – usually penne – and I must say it made a huge delicious difference! Some dishes are just better with a little extra cheese in them. One thing though, the leftovers of this dish do taste good, but, it’s much better when you eat it right after you make it because the sauce is super creamy then. Bring a large pot of salted water to boil and cook the tortellini according to the package directions. Reserve 1/2 cup of the cooking water and then drain the pasta. While the tortellini is cooking, melt the butter in a skillet over medium-high heat. Add the shallot and cook, stirring until slightly soft. About 2 minutes, making sure not to burn the shallots. Add the pumpkin and the nutmeg and continue cooking for about another minutes. Stir in the cream and bring to a low boil. Reduce the heat to medium low and let simmer while stirring until slightly thickened, about 5 minutes. Finally, add in the cheese and continue cooking until thick. Season with the salt and pepper. Add the tortellini to the skillet with the pumpkin sauce and toss to coat, adding some of the reserved pasta water to loosen the sauce**. Serve topped with parmesan cheese.